The New Jersey Sea Grant Consortium (NJSGC) offers a variety of marine science-based Girl Scout merit badge programs for all levels of scouting from Daisys through Cadettes. These programs are an opportunity to explore the marine environment in a fun and educational way while completing requirements to earn a badge. All programs are held at Sandy Hook; some are indoor programs and can be done during the winter or inclement weather, while others are outdoor-only programs. Programs are led by experienced NJSGC environmental educators. Equipment and materials are provided by the NJSGC, and registration is required. Daisy programs last 1.5 hours; all other scout programs (except Journeys) are 2 hours. For more information or to book a girl scout badge program, please contact Jody Sackett at 732-872-1300, ext. 20, or email at JSackett@NJSeaGrant.org. Scout programs can also be reserved online; select that option on the NJSGC Scout General Information Page and complete the application. Learn how to make the world a better place during this program. Through a scavenger hunt conducted in our laboratory classroom, girls will discover what can be recycled, what can be composted, and how to read recycling codes. They will make a recycled jellyfish craft, and go on a guided beach hike to collect shells and conduct a mini beach cleanup. Girls will earn the Rose Petal in this program. Scouts will learn about using resources wisely as they play a recycling game and use our rain barrel water collection system to see practical water re-use. Girls will go on a guided beach hike to collect seashells that they will re-purpose to make an arts-and-crafts project on the beach to take home. Scouts will earn the Clover Petal in this program. Scouts will explore the central elements of Size, Shape, Texture, and Color as expressed through science at Sandy Hook, in this program taught both indoors and outdoors. We’ll begin in our laboratory classroom, as scouts learn about various seashells found on NJ beaches and the animals that make them. They will play measuring games with shells and make a pompom Shell Friend to take home. Scouts will do colorful textural shell tracings, and paint seashells with paints made from nature, in crafts they’ll bring home. They’ll conduct a matching activity with seeds and flowers. We’ll go on a Scavenger Hunt hike to the beach, where the troop will go seining/dip netting in the bay (equipment provided) to find sea creatures, and collect shells to take home. For the Take Action Requirement, the girls will do a mini beach cleanup. Scouts will complete the Earth and Sky Journey in this 3-hour program. Get ready for an amazing coastal adventure! We start in our laboratory classroom where we learn how to make and interpret trail markings from shells, twigs, and rocks, and make GORP to eat on our hike. While on their hike from Fort Hancock through the maritime forest to the Sandy Hook beach, scouts will do a Scavenger Hunt that helps them identify and explore this seashore environment full of marine creatures, unique plants, and fascinating shells. Girls will earn the Hiker Badge in this program. Letterboxing is an amazing adventure game played all over the world. During this program scouts will create marine-themed Letterbox caches which they will hide in secret outdoor places on Sandy Hook for their friends to then find through coded clues. Each girl will also make her own unique stamper to use (and keep) when finding letterboxes. Girls will earn the Letterboxer Badge in this program. Through everyday items, girls will learn the basics of science, and how it’s applied to daily and marine life. The program is taught in our laboratory classroom, where we will explore the basic principles of magnetism, learn chemistry by combining kitchen ingredients to produce gases, discover density and salinity not only with common items but also how it’s applicable to marine environments, and make beach sand “bubble up” as we explore climate change’s effects on our oceans. Scouts will make “Flower Bombs” to take home, and earn the Home Scientist Badge in this program. Explore your five senses during this maritime adventure on Sandy Hook! The program is taught in our laboratory classroom, where we’ll touch live sea creatures in our Touch Tank, investigate unusual seashells, taste marshmallow “crabs,” explore the scents of Sandy Hook, learn to identify common animal calls, and design camouflage fish to hide in our laboratory classroom. Girls will make a multi-sense craft to take home, and earn the Senses Badge in this program. Marine bugs are fascinating creatures, and many different kinds call Sandy Hook home. Some live in the water or near the sand, and others, like Monarch butterflies, migrate right through Sandy Hook in the spring and fall. We’ll first learn about bugs in our laboratory classroom. Afterwards, we’ll hunt for marine bugs at the beach, seine fish in the Bay for aquatic bugs, and search along the edges of the salt marsh with nets for migrating butterflies. Girls will make a bug house to take home, and earn the Bugs Badge in this program. Girls will explore how important water is to our everyday lives and the environment around us in this interactive program that is taught both outdoors and indoors. We will go seining (fishing net and chest wader boots provided) in Sandy Hook Bay to discover how water functions in the salt marsh and learn how to protect that delicate ecology. Girls will learn the science of water through various activities in our Laboratory Classroom, such as how a Watershed works with pollution runoff, what is Salinity, how ocean waves can erode beaches, playing with Surface Water Tension, the Water Cycle, and how to clean up a simulated marine oil spill. We will also explore how much water we use in everyday activities, and how much water there really is on earth for us. We’ll practice conserving water through various activities including a rain barrel system. Scouts will make a craft to take home. This program covers the entire Wonders of Water Journey, so scouts just need to do their Take Action Project (suggestions provided) to complete the Journey. 4-hour program. Scouts will learn first-hand about the homes of Sandy Hook beach and salt marsh animals. We’ll start in our laboratory classroom, where girls will explore live aquatic creatures in our Touch Tank, and view marine animals living in our ten aquariums to learn how they live. Scouts will go seine fishing in the Bay to catch and observe marine creatures. We will discover secret clues about animal homes, and girls will make an animal house craft to take home. Scouts will earn the Animal Habitat Badge in this program. Scouts will study the science, usefulness, and beauty of classic flowers and natural wildflowers at Sandy Hook. We will begin in our laboratory classroom to learn the basic biology of flowers and pollination as well as adaption to harsh environments like Sandy Hook. Girls will create Victorian bouquets of various flowers to translate a secret message. They will play pollination games to discover which types of the many pollinators work best. Scouts will use their creativity (and fragrances) to artistically create the ideal flower, and then play a game to see which ones are actually pollinated. We will make Flower Bombs to take home. Girls will earn the Flowers badge in this program. Junior Journey: It’s Your Planet, Love It! The Junior Journey focuses on energy, whereas the Brownie Journey focused on uses and properties of water. Here’s a description of the Get Moving! Journey at Sandy Hook: Girls will explore how important energy is to our everyday lives and the environment around us in this interactive program that is taught both outdoors and indoors. We’ll learn about potential and kinetic types of energy, from both active sources like coal and oil, as well as passive sources like wind, solar, wave, and bacteria. We’ll go seine fishing in the bay to collect creatures that use energy, including plankton. We’ll play an outdoor game to learn how energy is transferred within the food chain. In the laboratory classroom, we’ll examine plankton under the microscope, learn about heat energy transfer, discover microplastics, play a marine debris biodegradation game, explore alternative energy sources, and make recycled paper that’s decorated with Sandy Hook natural elements. Scouts will learn about conserving energy through recycling, and will conduct an Energy Audit of our 1890s restored Fort Hancock building. This program covers the entire Get Moving! Journey, so scouts just need to do their Take Action Project (suggestions provided) to complete the Journey. 4-hour program. Scouts will begin in our laboratory classroom by learning the biology of trees, leaves, and seeds. We’ll play a game to identify different types of trees, and learn about the many kinds of trees on Sandy Hook which can survive in the harsh seaside environment. Scouts will compare leaf structures under the microscope, listen to legends about trees, discover the usefulness of trees for food, shelter, animal habitats, and even Native American medicine and transportation. Girls will play a seed dispersal game to learn about nature’s various strategies. Scouts will hike through the maritime forest and do a classic tree sketch. Girls will earn the Trees Badge in this program. Girls will learn how marine animals can help us directly, like rescue dolphins, and indirectly, through science. We’ll start in our laboratory classroom, where scouts will conduct their own animal behavior experiment using hermit crabs and snails, and learn about the beneficial Horseshoe Crab by touching baby ones and examining microscope crab slides. 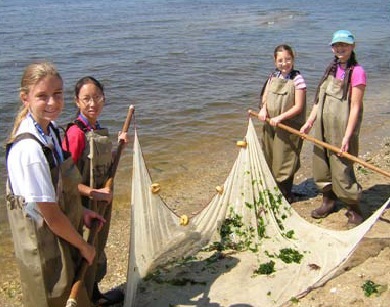 Scouts will go seine fishing in Sandy Hook Bay as “field biologists” to observe our animal helpers first-hand, and earn the Animal Helpers Badge in this program. Our annual twilight walk of discovery at Horseshoe Cove on Sandy Hook will be held again in 2016. There are two available sessions: June 17th from 6:00 – 8:00 pm, and June 18th from 6:00 – 8:00. With a warm high tide and a full moon, it’s the perfect time to see horseshoe crabs on the beach. We will learn about this amazing living fossil through hands-on exploration, crafts, a Power Point lecture, touch tanks, and other activities in our laboratory classroom. Open to all ages of scouts and their families. To register, click here.